John and Eva Nuffer are pleased to announce the marriage of their daughter Regina Friederike to John George, son of John and Anna Wanner. John and Regina were married 31 August 1898 in the Logan LDS Temple, Logan, Cache, Utah. 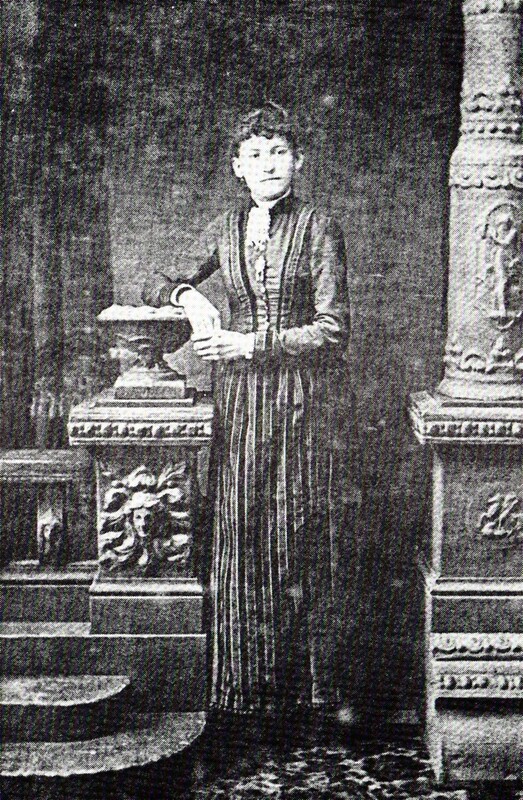 Regina Friederike Nuffer was the first child of four born to the marriage of John Christoph Nuffer and Eva Katharina Greiner on 26 January 1869 in Neuffen, Esslingen, Wurttemberg. John was a widower when he married Eva endowing Regina with two older half brothers and sister, John (1862), Georg Friedrich (1864, Fred), and Christiane (1865, who lived less than a year). John and Eva were married 25 July 1867 in Neuffen. Regina had three younger siblings, Charles August (1871), Adolph (1875), and Mary (1881). Regina was christened 7 February 1869 in Evangelische Kirche, Neuffen. Evangelische Kirche, Neuffen and Paul Ross. The Nuffer family attended this church and Regina was christened here. When Regina was about 9 years old, she heard the Mormon Elders preach in town. One of those Elders was John Jacob Theurer (1837 – 1914) of Providence, Cache, Utah. 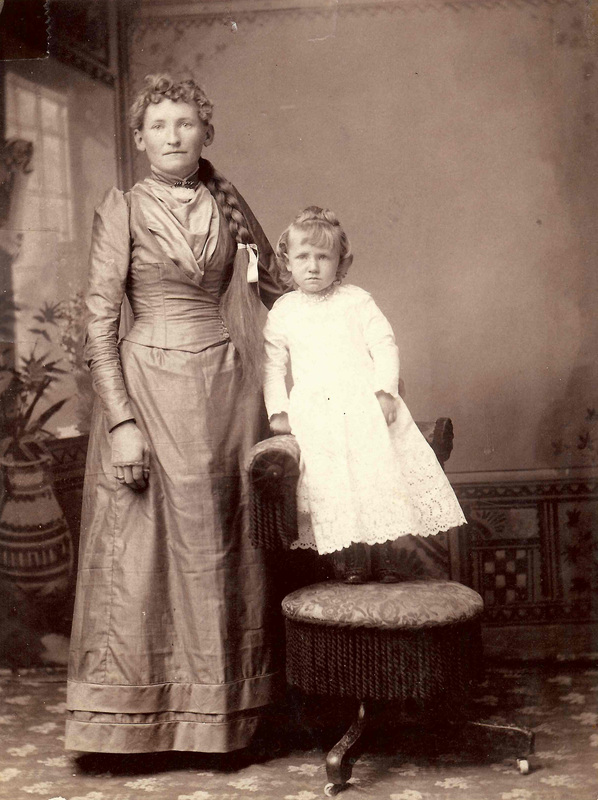 She was converted to the LDS church and was baptized 1 January 1880. Her parents were baptized 12 April 1880 in the mill race behind their home in the very early morning to avoid others in the community knowing. Other siblings followed later. 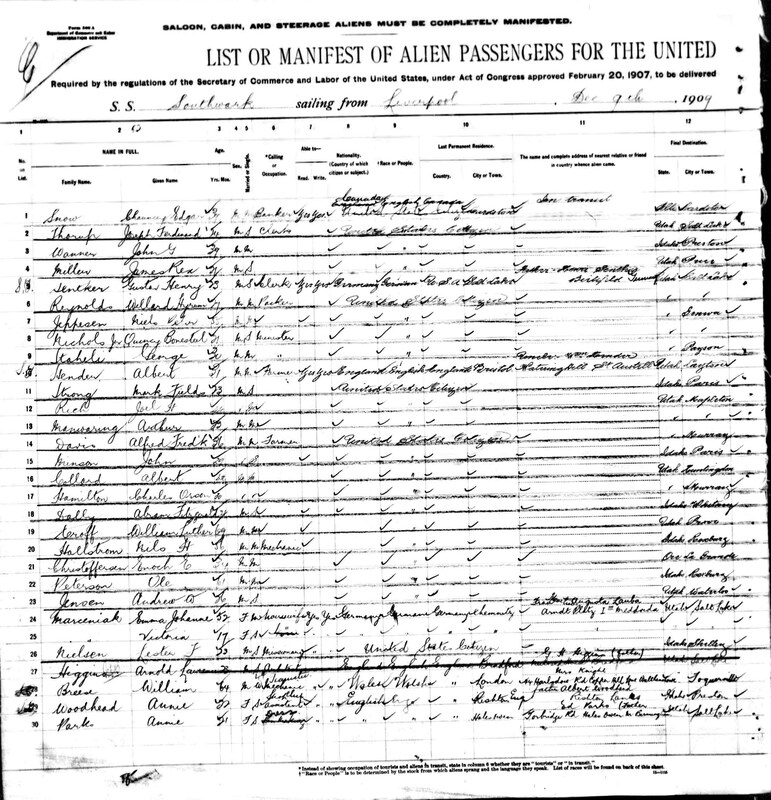 The family applied to immigrate to North America in April 1880. They left for Stuttgart, then to Mannheim on a boat to Holland, over the North Sea to Hull, England where they left on the Wisconsin for New York. From Castle Garden they went by train to Utah, finally arriving in Logan. The family moved to Providence, Cache, Utah where Elder Theurer had connections. Mary, Regina’s sister, was born in Providence in 1881. 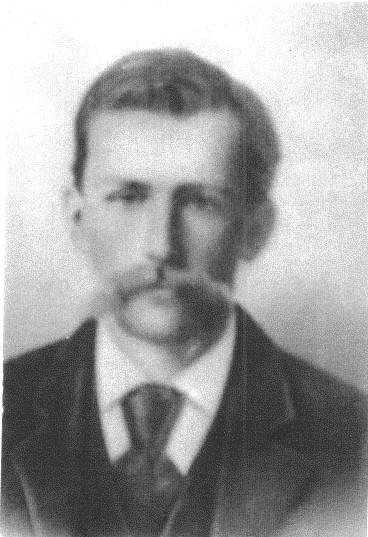 John Jr worked in Montana, Salt Lake, and on the Logan Temple. After the Logan Temple stonework was completed, the Nuffers sold their home in Providence and moved in 1883 to Preston, Franklin (then Oneida), Idaho. Eventually they moved around until John and Eva purchased property up Cub River near Mapleton (then St. Joseph), Franklin (then Oneida), Idaho. I don’t know the details of how or when, but Regina met Jacob Scheibel and married him 15 July 1889 in Salt Lake City, Salt Lake, Utah. 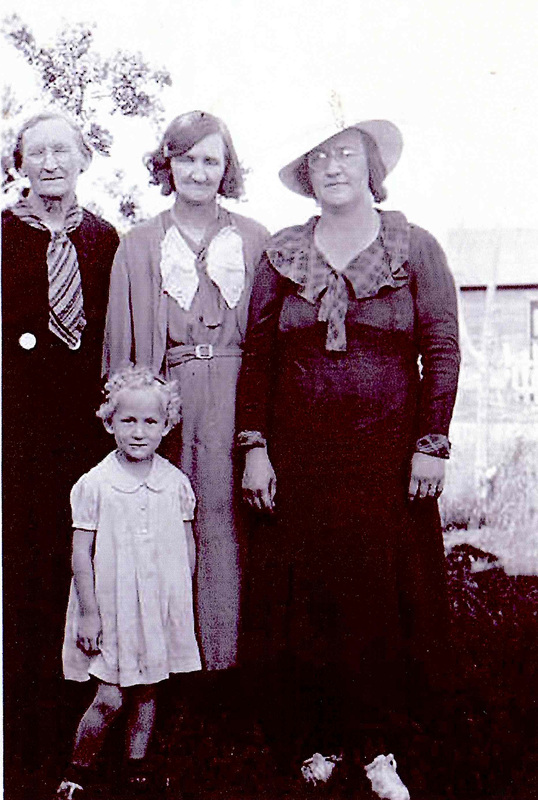 Alma Katherine (“Kate”) Scheibel was born 27 September 1889 in Pleasant Valley, Carbon, Utah to Jacob and Regina. In 1890, Jacob and Regina separated and she moved back to Mapleton. She helped as a nurse and midwife while her mom helped tend little Kate. It was during this time she met a young man named John George Wanner Jr who was working for her brother Fred Nuffer, also in Mapleton. 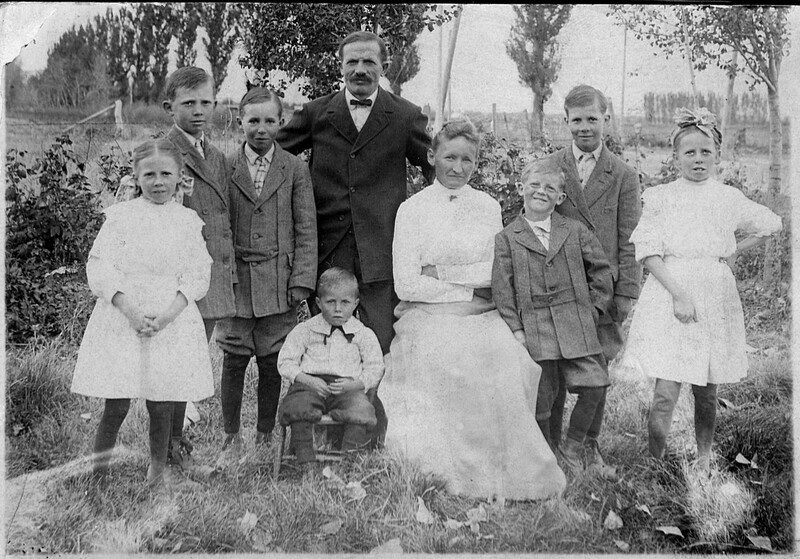 John George (anglicized from Johann Georg but called George by the family) was the first child born to the marriage of John George (also anglicized from Johann Georg) and Anna Maria Schmid on 29 October 1870 in Holzgerlingen, Böblingen, Württemberg. To keep them separate, younger John George went by George. He was christened 30 October 1870 in Holzgerlingen. He grew up in Holzgerlingen and during the summer of 1890 met the LDS missionaries. He was the first of the family to join the new church on 11 July 1891 and was baptized by Jacob Zollinger (1845 – 1942) of Providence, Utah. 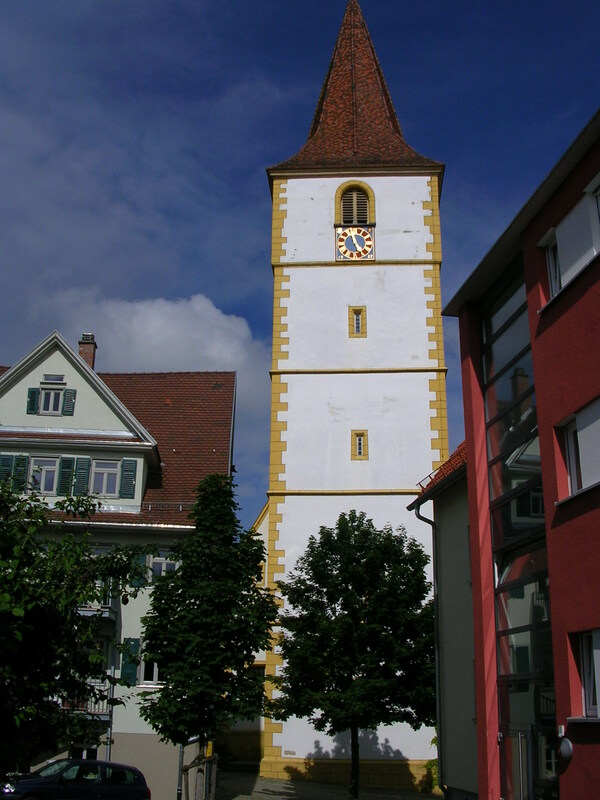 St. Mauritius Church in Holzgerlingen, the church where the Wanner’s attended and where John was christened. George met Eliza Stirland of Providence and married her 14 November 1894 in the Logan LDS Temple. Two children were born, Earl Wayne Wanner born 31 October 1895 in Providence and George Phineas Wanner on 22 September 1897 in Glendale. The unhappy marriage ended in divorce. Nobody seems to know what happened to these two sons either. Regina received her Patriarchal Blessing 13 September 1897 from John Smith. George and Regina fell in love and married in the Logan Temple 13 August 1898. William Christoph and Willard John were born 9 November 1899 in Mapleton. 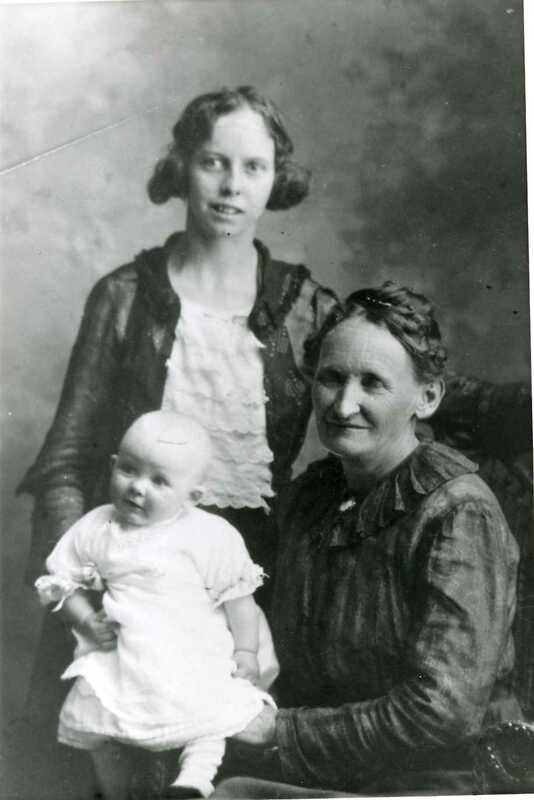 Mary Louise was born 5 March 1901 in Mapleton. 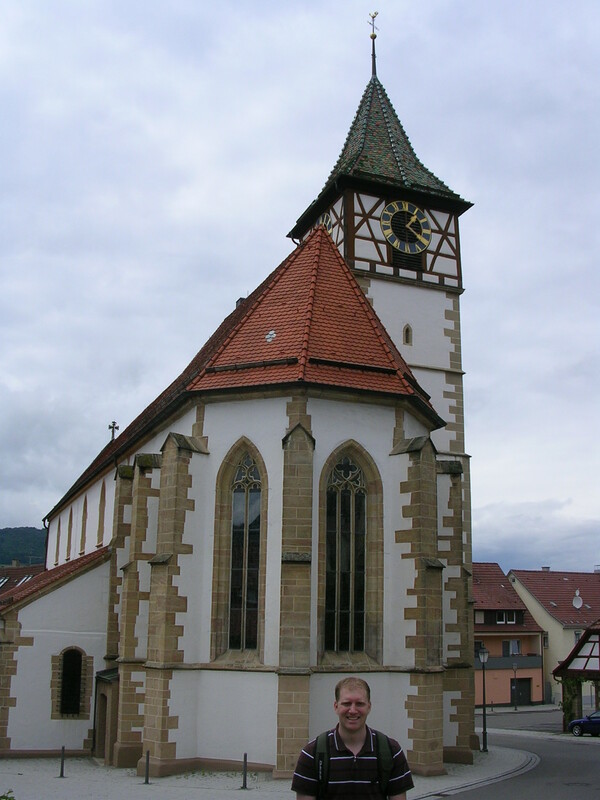 George was called and set apart as a missionary to Germany on 1 October 1901 . Acceptance Letter from John to Lorenzo Snow, President of The Church of Jesus Christ of Latter-day Saints. 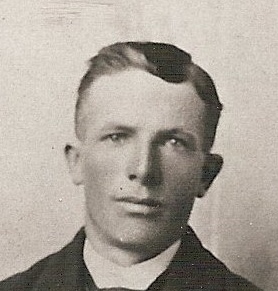 Golden was born 4 September 1902 in Mapleton while John was on his mission to Germany. George safely arrived home 7 October 1903. Eva Virtue was born 24 February 1904 in Mapleton. Rulon was born 6 November 1905 in Mapleton. About this time, George Wanner had John Nuffer build him a home on East Oneida Street in Preston. George was then called to serve a second mission in the fall of 1907, again leaving pregnant Regina and six children. He was set apart by Orson F. Whitney on 29 October 1907 to serve in the Swiss and German mission. Interestingly, the missionary record says he was plurally married, but no records or history show another marriage. I suspect it is a mistake. Serge Nuffer was born 8 March 1908 in Preston. Again, another child born while John was on a mission. Regina with William and Willard in the back and then Golden, Mary in the middle, holding Serge, then Rulon, then Eva. This picture was taken and sent to George on his mission. George left Europe sailing on the Southwark from Liverpool, England on 9 December 1909. George returned home on Christmas day 1909. It was during this mission that George taught the Christiana Wilhelmina Andra family. The Andras immigrated to Preston. William Andra, Christiana’s daughter, would later marry George’s daughter, Mary. In 1910, George and Regina purchased the Wanner farm (John’s parents) in Whitney (which the Wanners had purchased from the Nuffer family). His parents moved to Logan. 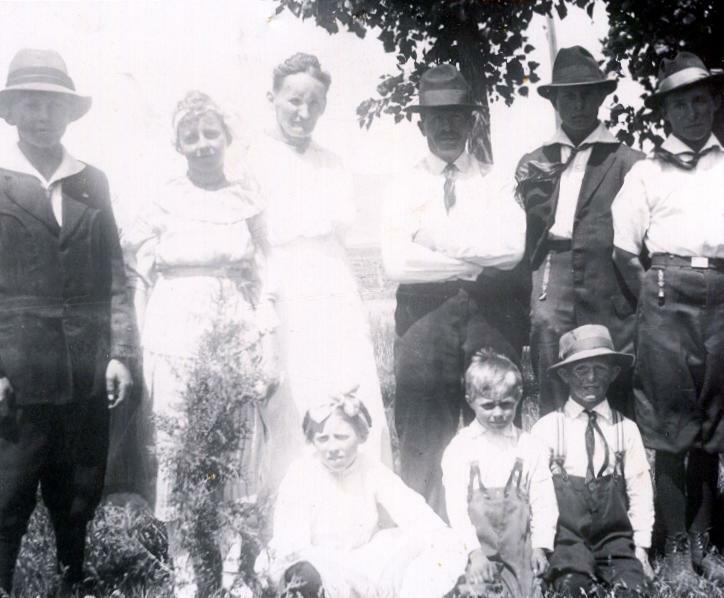 About 1912, this picture was taken on the farm. Another photo from about 1917. Sadly, things started to change their idyllic world. Golden died 26 November 1918 in Salt Lake City at age 16. His death certificate says he was a student, Regina is the informant, but I don’t know where he was going to school. I was told he died from influenza, but the death certificate just says natural death. William died 1 December 1918 at Camp Genicart, Gironde, France from influenza. He enlisted with the army 5 August 1917. I don’t have anything to back it up, but I suspect the photo above is in preparation for his enlistment. He left Salt Lake City for Camp Kearney on October 11, 1917. He served in the Supply Company, 145th Field Artillery, American Expeditionary Forces. The war did not kill him, disease did (as was common then with influenza). His body was brought home 11 November 1920, and interred in the Whitney Idaho Cemetery. Mary married William Andra 10 March 1920 in the Salt Lake City LDS Temple. 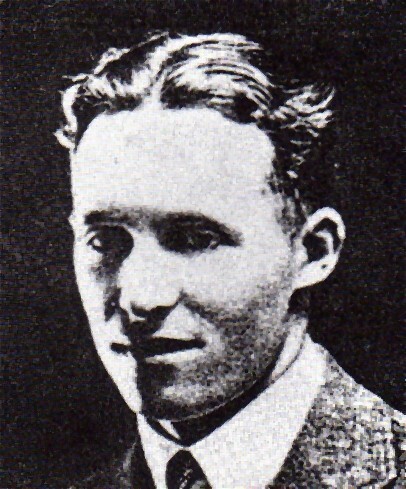 Willard was set apart as a missionary 7 January 1921 to New Zealand by Melvin J Ballard and left for the mission 8 January 1921. He successfully completed his mission and ended his service 18 October 1922. Willard married Gladys Laverna Thompson 15 November 1923 in the Logan LDS Temple. Rulon was a student in Logan when he caught a cold. It developed into acute meningitus caused by acute otitis media. He died 25 February 1924 at the age of 18. George is the informant. George was called to serve a third mission to the Southern States Mission. He was set apart 15 December 1925 by Joseph Fielding Smith and departed 16 December 1925. He returned home 8 June 1926. On 4 July 1926, George received his Patriarchal Blessing under the hand of William M Daines. Serge was set apart as a missionary 24 April 1928 to New Zealand by Orson F Whitney and left for the mission on 28 April 1928. He arrived in New Zealand 20 May 1928. He served in the Bay, of Island, Whangerei, and Wellington districts, and on the South Island. He cut himself while shaving and died from blood poisoning 4 October 1929. His body was brought home for burial in Whitney with the funeral held in the Preston opera house. Four sons were now deceased. 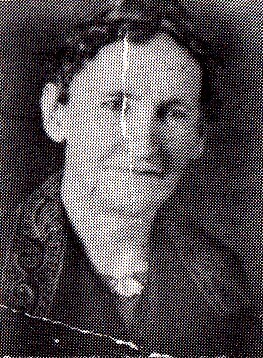 Eva was set apart as a missionary 16 April 1930 to California by George F Richards and left for the mission 17 April 1930. She completed her service 6 June 1932. George was called to serve a fourth mission to California. He was set apart by Reed Schmid on 1 December 1933 and left for the mission the same day. He arrived back home 6 April 1934. Eva married Adolf Ernest Spatig 29 January 1936 in the Logan LDS Temple. George was known for his ability to work hard. He worked hard, raised his crops, and took exceptional care of his farm animals. He took great price in having things looking neat and clean around the farm and yard. George and Regina sold the Whitney farm and purchased 40 acres nearer to Preston and built a home on it. Oakwood Elementary and Preston Junior High sit on what was part of this farm. When he retired, it was this farm he sold to William and Mary Andra. George had a knack for being successful in the various undertakings he engaged in. He was one of the first in Preston to have an automobile. When he brought it home he hadn’t quite got the knack of stopping it. He yelled “whoa” when he got in the garage, but before he got it stopped he had gone through the end of the garage. George built two little homes on the west side of 2nd east and 1st south in Preston. He also built three homes on 1st south and the south side of the street in Preston. George and Regina lived in one of those homes until she died. Regina passed away 10 March 1942 in Preston. She was buried in Whitney. She was ill for quite a while before she passed away. George would care for her the best he could and regularly took her for rides in the car. She was unable to walk and George would carry her on his back from place to place as they went visiting. George remarried a few months later Grace Irene Frasure (1893 – 1980) on 3 Jun 1942 in the Salt Lake City LDS Temple. Their marriage dissolved in divorce. George was having a number of health issues and had heard that Florida would help him. He moved to Florida. It was there he met Annie Jane Metts (1873 – 1961). 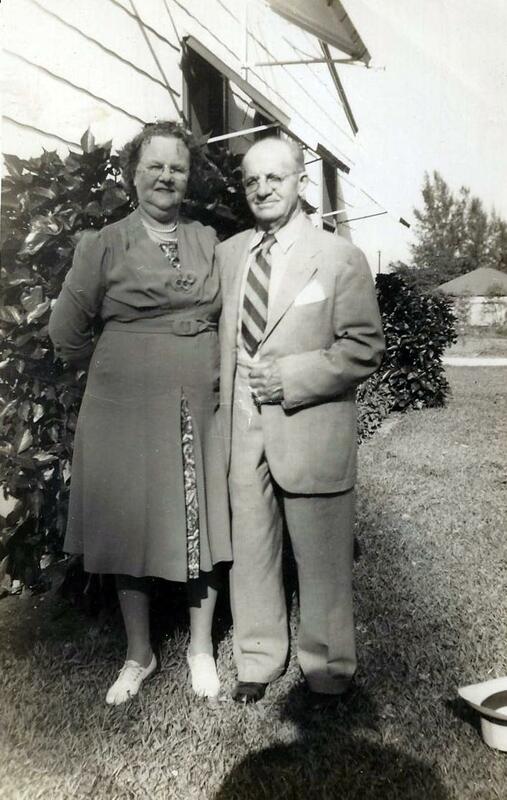 They were married 4 May 1945 in Fort Myers, Lee, Florida. This marriage also dissolved in divorce. George remained in Florida until he became ill enough that he knew the end was coming. His daughter, Mary, sent her son, William Andra, out to Florida to bring George back by train. When William and George arrived in Chicago, Cook, Illinois, he was quite ill and taken to the hospital. It was there that George passed away 5 January 1947. William brought George’s body back to Preston. George was buried beside Regina in Whitney. Here is the last page (of three) given to me from Gib & Janet Richardson of my Grandfather, Norwood Jonas. 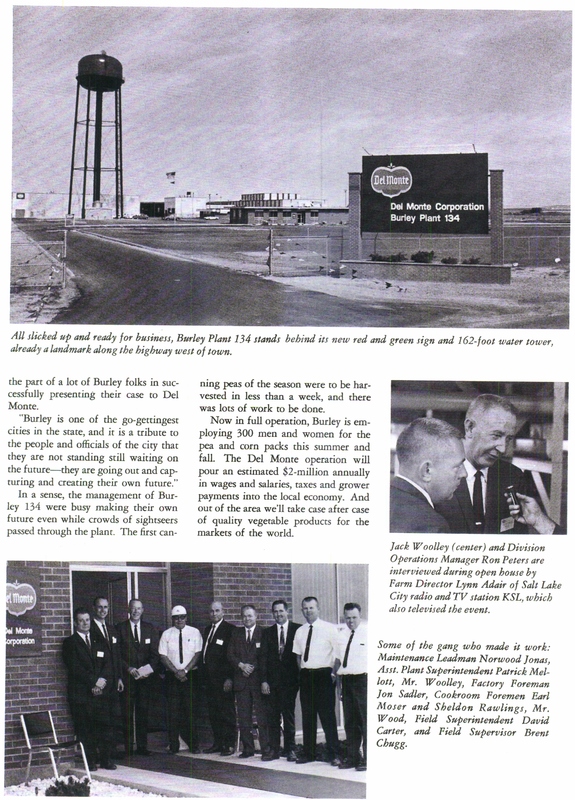 This picture resembles much the Del Monte plant in Burley, Idaho as I remember it as a kid. My Grandma and I would go and drop things off from time to time. I don’t remember what we dropped off, but we were there on a fairly regular basis. I do not remember the plan having changed much at that time from 1969 to my memories in the mid 1980’s. I remember as a boy my Mom would often remind me as we drove past Del Monte that my Grandfather helped build that water tower. I don’t know how much he actually helped build it, but since he worked in maintenance I assumed he helped with its maintenance. Who knows. Too much time has probably passed to know for certain. I tried locating information on the rest of the people in the pictures. Many are likely still alive. I tried searching names but none were an obvious match. I will have to do more work to pin some of them down. 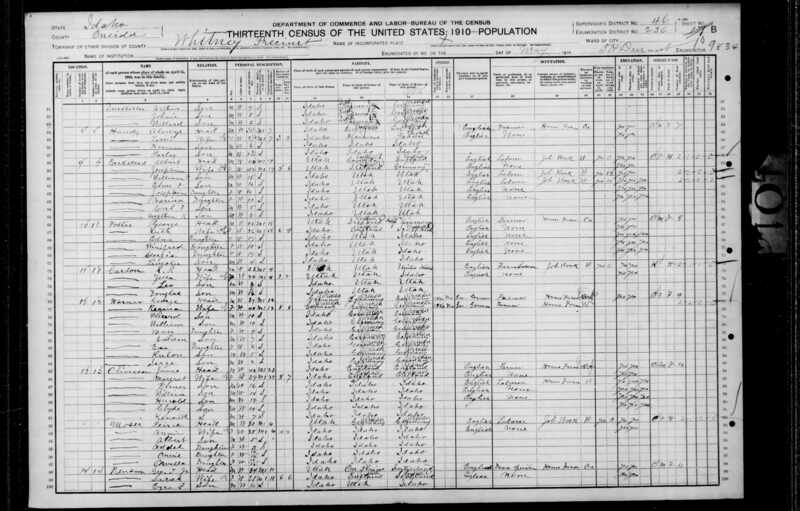 Jack Wilson Woolley, 18 Jan 1919 in Portland, Multnomah, Oregon to 28 Jun 1973 in Ogden, Weber, Utah. Wilburn Norwood Jonas, 15 May 1924 in Richmond, Cache, Utah to 14 Mar 1975 in Burley, Cassia, Idaho. Jon Reinhold Sadler, 4 April 1940 in Nevada to 6 November 1978 in Roy, Weber, Utah. Sheldon Rawlings, 9 Mar 1927 in Fairview, Franklin, Idaho to 8 Feb 1993 in Bountiful, Davis, Utah. This is the life history of Charles August Nuffer. He wrote this autobiography on 28 January 1949. I have maintained the language and spellings of the original document. I also wrote a quick overview of his life previously. This is a brief history of the life of Charles August Nuffer, son of Johann Christopher Nuffer and Eva Katherina Greiner Nuffer. I was born June 18th 1871 in Neuffen, Wurtemberg, Germany. When about eight years old I remember going with my father and mother to a neighbor’s home where the Mormon Elders were holding a meeting, one was Elder John Theurer of Providence, Utah. Some week later, one morning on getting up the floor was all wet, I asked my mother why, all that she said was that they were baptized members of the Mormon Church last night in the Mill Race back of our house. The first place we came to was called Castle Garden where all our belongings were examined. They also gave all the emigrants a little book, the New Testament to take along free. In those days most of the streets of New York were paved with cobble rock. After a few days rest we went by train to Collinston. Arriving in Logan we were taken by a family of Saints that gave us food and lodging for about three weeks by the name of Shaggo in North Logan. After three weeks we found a little old log house with one room and a dirt roof and plenty of bed bugs to keep us company. It was on a vacant lot on the street going to the College just east of the canal. We lived there about a month, as father bought a house and lot of Jacob Engle, full of cobble rock where we intended to make a living but we found it hard going. The house was built of small cobble stone and in the winter at night the walls would get all white with frost. Father would go out where ever he could get some work, he worked on the threshing machines and I went with him to help and he got a bushel of wheat a day. Grandma Spring, Regine and I went out in the north field to glean wheat, we would cut the heads off and put them in a sack. Father threshed them out with the flail and it made about sixteen bushels, so about all father could do is to earn for us so that we could have something to eat while John and Fred were earning money to pay for the place. Fred went to Idaho working on the Railroad and John worked for Mr. Summers a contractor who later recommended to the Stake Presidency to take charge of building the Stake Academy after we had moved to Idaho. It seems to me the Lord had already begun to open up the way for our life’s mission in this part of the land. When we arrived in Providence the potatoes were in full bloom on the lot which looked good, at least we would have potatoes to eat. We had to get the wood from the hills near by. They had bought a team and an old wagon so we went to get some wood. Father told me to drive, as I drove out the gate and over a little ditch the tongue dropped down and the reach came up and the team ran away and I fell under the horses feet. I received a broken shoulder and the horses ran around the block and back in the gate, my first time driving a team, at ten years old. While living in Providence I went to school a few months during the winters of 1881 and 1882 and learned to speak English. My teacher was Mrs. Mary Neaf Maughn, the mother of Mrs. A. E. Hull and Maughn the brush man, and Peter Maughn was the other teacher. I was baptized when I was 9 years old by Mr. Campbell the grandfather of Mrs. C. M Crabtree of this ward. My sister Mary was born here October 11, 1881. 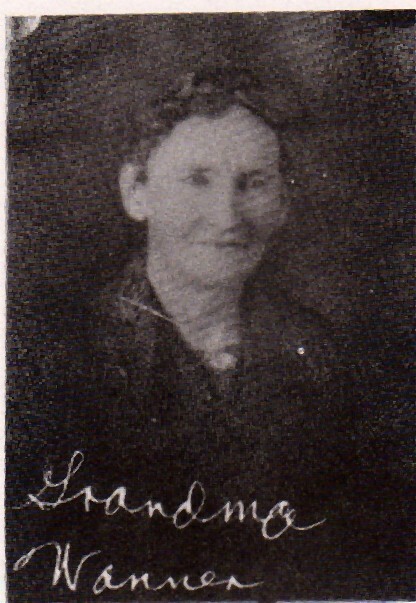 She died in Mapleton, Idaho, October 5, 1900. I look back to my young days while living in Providence, and I still have many friends there, but my parents had to look forward to some other place for our future and to find the place for our life’s mission. It seems the Lord prepared the way. One of our neighbors, a German family had a daughter married to John Miles who was living at Wormcreek and she wanted him to move to Providence where her mother lived so we traded places. We lived in Providence from June 1880 until October 1883. So from here we go to Idaho the place the Lord had chosen for us to build our future home. We loaded what we could on our wagon and Mr. Miles the rest on his as he helped us move and all together it was not very much, but it was all the poor teams could pull over the kind of roads there were at that time. On arriving at Wormcreek we found a place with a house on it, a log house about 14 by 16 feet, all one room, with dirt floor, no fence around it and no plowed land, and when it rained the mud would run down the walls and we had to set pans on the bed to catch the rain. Father, Mother, Regine, Adolph, Mary and I lived there then. Fred was out in Oregon but he came later that fall with two big horses and John was working in Logan, I think with Mr. Summers. During the winter John rode the biggest horse to Providence as he was going with Louise Zollinger whom he later married. The horse got warmed up too much and got a sore leg and they finally had to shoot him. John and Fred were in Providence most of that winter as their grandmother lived there and Fred was going with Anna Rinderknecht. As we did not have much hay we bought two stacks of straw from Jap Hoarn and Tom Miles, the first lived in Richmond and the other in Smithfield as they were only on their farms in the summer. The snow as so deep Regine and I filled some big sacks we had brought from the Old Country with straw and tied on the hand sled and pulled it over the rested snow for home. The Miles were the only family that were living on the Creek besides us on what is now known as the Webster Ranch, and we lived on what is now known as the Fred Wanner Place. The Miles Family ran out of feed for their cattle so in March they shoveled a path over to the south side of the hills where the wind and sun had taken the snow off the grass and it had started to grow. When they drove the cattle through the path you could not see them because the snow was so deep. So with the help of the Lord we pulled through the Winter of 1884. In the Spring John and Fred came back and began to fence and plow the land and plant crops. Later John went over to Oxford to the Land Office to file on the land for himself as he had helped most to pay for the home in Providence. As father wanted a homestead of his own, one Spring day it was on the first of May he sent over the divide between Worm creek and Cub River to find a place where he could make a home for the rest of the family. When he returned he said that no one had gone over there before him that spring, as the snow had not melted yet. That was in the spring of 1885, so during that summer John and Fred were raising the crops and helped father build a log house and we put in some crops so we have something to eat for the winter. As we did not have much of a team they had Joe Nilsen come up from Preston to plow some along the Creek, he had a big team and a sulky plow. But that was not all, we had to fight squirrels and grasshoppers. What we raised that summer had to see us through the Winter, and it was not any too much. On Christmas Day 1884 Father sent me over to John’s (Grandma Spring was keeping house for him that winter), after twenty-five pounds of flour. The snow as up to my knees. After that flour was gone we had to grind the wheat in the coffee mill as no one went to the store anymore that winter until Father and I each carried a basket of eggs to the store in Franklin on the 2nd of March, over two feet of :frozen snow to buy some groceries. We could not busy much as we had no money. Mother raised some sugar beets in the garden, as we had no sugar she but some beets in the oven and baked them and put them in a cloth to get some syrup to make her yeast. She cut some up in little squares and browned them in the oven and ground them up to make coffee. Mother would also put the wheat in the oven to dry and brown it just a little so it would grind better and we used it for bread and mush. Finally the cow went dry so we had no milk for some time and no sugar, but we got through the winter without any sickness. We thanked our Heavenly Father for what we had and lived by faith in our Heavenly Father as we had no Church organization of any kind at that time there. It seems the Lord wanted a tried people to build the Valleys of the Mountains for when we began to raise crops that we might have food for the next winter, we had to fight the squirrels and the grasshoppers. We worked with faith that did not falter and as I remember we never got discouraged for we felt the Lord was on our side. When I was going on 21 years of age I was looking for a homestead to file on. East of my father’s place, about 40 rods from our house in a hollow there was a nice little spring by a service berry bush coming out of a sandstone formation, where I decided to make my home. Not being of age to take up land, I moved a little log building with a dirt roof on it, that my father had used for a granary, onto the land. I had a bed in it and would sleep there some nights. I prayed to the Lord that he would protect it for me, that no one would file on it as I was not yet twenty-one, and not old enough to take up land. There was a man by the name of George Kent, down on the river. His wife told me there was a relative of theirs in Lewiston, Clyde Kent, who was going to jump that land, as they called it those days. I told them that I did not believe he would be that mean. I wanted to start life for myself as soon as I was 21. So on June 17, 1893, I was on my way to Blackfoot, Idaho by train in company of John McDonald, whose fare I paid to Blackfoot, and return as a witness for me as to my age. There was no bridge across Bear River to Dayton at that time. We stopped at Pocatello over night; it was not much of a town at that time, mostly railroad shops and saloons. We arrived at Blackfoot on June 18th, on my 21st birthday to file on that homestead. When I told them at the land office of the land I wanted to take up, they told me there was a man there some months before, the man I spoke of. Not giving up hope altogether we looked over the plat, and I found there was 40 acres all to itself, not filed on. After looking things over for awhile I said to Mr. McDonald that is the land my cabin and the spring of water is on; so I filed on it and returned home. Arriving on Sunday afternoon my mother said there was a man and his wife looking at your place, as they thought that I had lost out. My family with me felt to thank the Lord that I had a place to build my home on. As Fred and I started to quarry sandstone on my father’s place that fall, I hauled some sandstone in the Spring to build me a house, but during that winter 1893, my mother came down with pneumonia and died within a week on the 26th of February 1893. She was buried in the Preston Cemetery. She was about the 2nd or 3rd person buried there, as the new cemetery had been started that year. 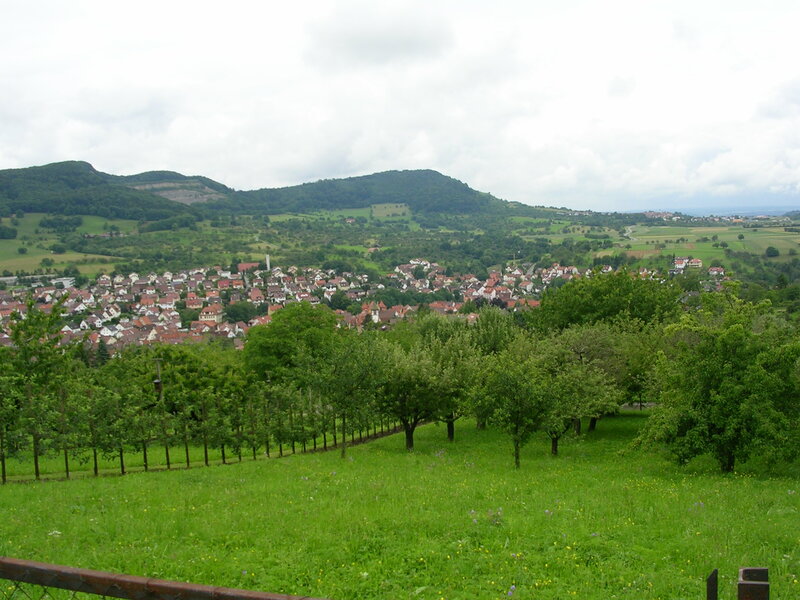 The following Spring the Wanner family came to Mapleton, from Germany, on my birthday June 18th, which was a Sunday. This was the first time that I had seen my life’s companion, as they came to my brother Fred’s place, where they lived until they found a home to live in. Christine was their oldest daughter and I fell in love with her at first sight. My sister Regine was home again from Montana, her husband had left her, she had a little girl Katy. Christine stayed with her until she went to Millville to work for the Pittgins family for about three months for seventy-five cents a week and her board and some old clothes. When she left they gave her $6.00 and she gave it to her father as he told her she had to earn some money yet before she got married. That fall as I started to haul stone to build a house, besides taking care of my father’s farm—Adolph helping me, as my father was away most of that summer to Bear Lake and other places, because he didn’t feel like staying home after Mother died. When he came back he brought with him Sister Weirman, and married her in the Logan Temple. Well, during this time I had started to build my house. We dug a hole in the ground and poured water in and mixed it. That was what we used to lay up the walls, and the house is still standing. By New Years the house was finished and cleaned, but we had no furniture or anything else to put in it, but still we made our arrangements to get married. We were baptized by Heber Taylor on 26 June 1894 in Cub River and confirmed by Edward Perkins at Mapleton on the 27 Jun 1894. 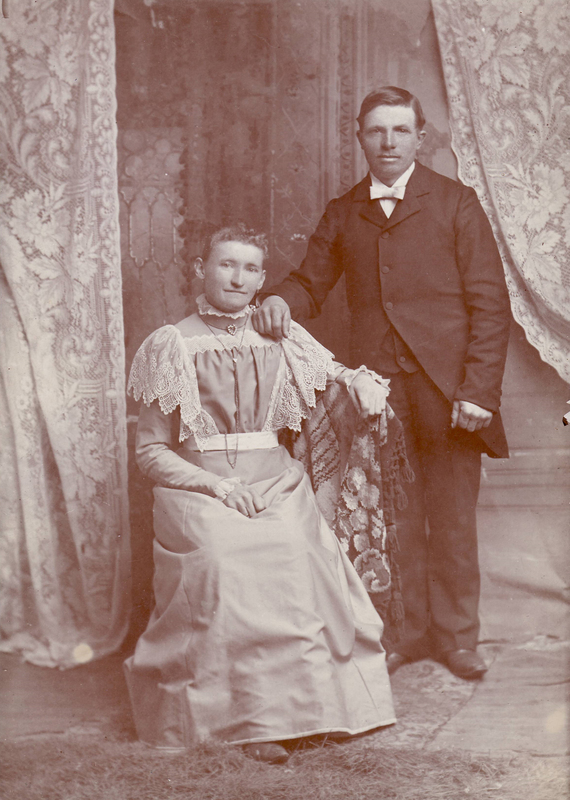 We were married 1st February 1894 in the Logan Temple by Marriner W. Merrill, president of the temple. (Read Christina’s biography here.) We made the trip by team and wagon, as there was no snow on the ground in the valley. We put our team in the Tithing Barn, as the Lalladine family were the caretakers. After returning from the temple, for supper we were invited by Charles O. Card at their home on depot street, as Mary Wagstaff’s mother’s sister was working at their home, and we spent our first night with them. He is the Card after which the city of Cardston, in Canada was named, as he later moved to Canada. As I have said before, after we got the house finished we had nothing to put in it and had no money to get married with, so I asked Grandpa Wanner if he would loan me $10.00 and I would pay him back when I raised a crop. He let me have the money with which we bought our marriage license, and a few dishes for the house. We borrowed a table and an old set of knives and forks from my sister Regina, as she did not need them at that time. We returned them again when she got married to George Wanner a year or so later. We paid Grandpa in seed grain the next fall with many thanks to him for his kindness. For our wedding present Grandpa and Grandma gave us a bedstead to sleep on, as we had no furniture. I nailed some boards together for a cupboard for dishes. Stepmother Weirman Nuffer made some of our temple clothes and the garments were made out of factory. She was helpful to us in many ways, so that was the beginning of our family life in a humble way and we were happy together. As Adolph was still at home, he and I ran my father’s farm, and I fenced my 40 acres, and started to plant some of it as fast as I could break it up. I helped Fred in the sandstone quarry to get a little money to buy a few things till we raised a crop. The Wanner family bought John’s place on Worm Creek for $2000 and became very successful farmers. 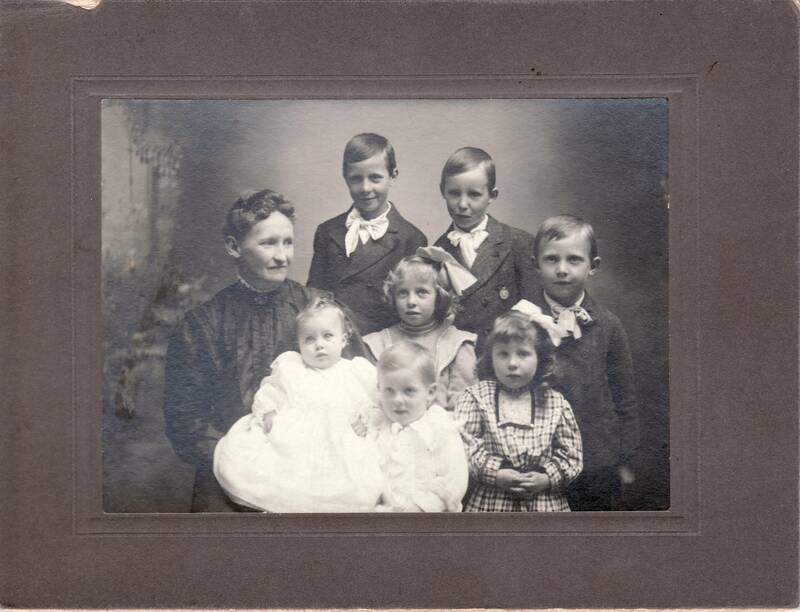 Will pass over a year or so till the first child Clara was born 10 August 1895, Louise 19 Nov 1896, Anna the 8 January 1899, Bertha 9 Jun ‘900, Fred 21 October 1901, Joseph 18 May 1904, Ida 15 Jun 1906. These children were all born in Mapleton. From here on my main occupation was farming and quarrying sandstone. I cut grain with a binder for people in Mapleton at one dollar an acre. In the winter I worked with Fred on the Mink Creek Canal, blasting the rock with black and giant powder, making the canal from seven to ten feet wide. I worked out four hundred dollars in ditch stock and finally sold it for forty cents on the dollar. I received $1.50 a day in cash so that is all I got for my work, and we had to sleep in a tent in the wintertime and cook our meals but it build the canals so the people would get water for their land and could raise crops. When Fred moved to Preston I took over the stone quarry. I was also ditch rider for the Preston Cub River Canal for a number of years, making a trip a day while the canal was full, at a dollar a trip. While runnig the quarry I delivered stone for some of the Preston business buildings and for the Lewiston Meetinghouse. During this time we were also taking care of John and Fred’s grandmother for a number of years. As the family was getting larger I built another room on the house as mother was busy taking care of Grandma Spring, and John was going on a mission to Germany. They decided to send Grandma Spring to Blackfoot where she died a year of so later. I think it was in the year of 1897, when Mother and I drove to Blackfoot with the team and buggy to take the rest of our homestead, that we had lost by that Mr. Kent beating me to it before I was of age. While at Blackfoot we called at the hospital to see Grandma Spring. They told us she had died before Christmas the year previous, and they had sent no word of her death to anyone. A few words more while at the land office it seems the Lord had always prepared the way for us. As we entered the land office the first person we met was President George Parkinson, who knew us well. Without his help our trip might have been in vain, as it was difficult to take up land when another party had filed on it. At the time we made this journey this was the frontier of the west. Where Downey is now there was not one hours and from Pocatello to Blackfoot was all desert, not a house, only the Indian Reservation. I carried my shotgun with us for safety. We could say much more, but it would take too long to tell it. From here on it made a lot of work; to fence the land and break it up and get it ready to farm and to make a living for the family. From here on I will begin tow rite of some of my work in the Church for which we have left our native land. On April the 19th, 1896 the Stake Presidency, George Parkinson, Brother Cowley, Solomon Hale came to Glendale to form a German Organization, so we could hold meeting every two weeks, as there were many families Swiss and German that could not speak English. Addison Wagstaff was Ward Clerk and took the minutes. 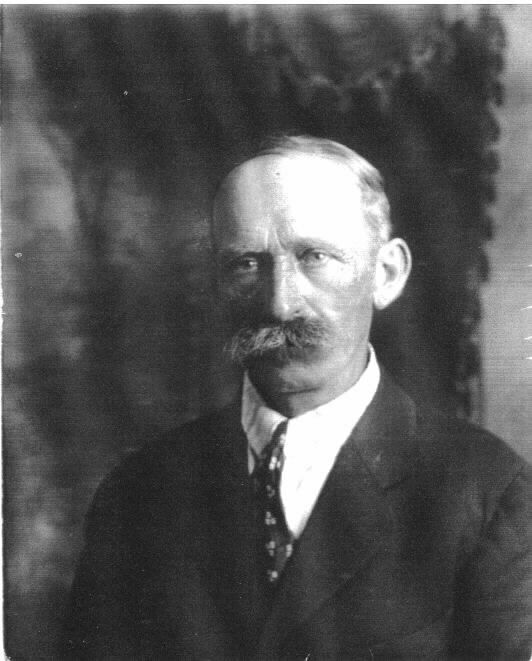 Brother Jacob I. Naef was chosen as President. It was not until 5 Jul 1896 that his counselors were chosen, Brother Jacob Schneider, first, Charles A. Nuffer second counselor. We held our meetings in the homes of the people on their farms and wherever they lived. They traveled with farm wagons a distance of20 miles one way to Mink Creek, Weston, Riverdale, Whitney, Treasureton, Mapleton, Preston and Glendale, there places were we held meetings. 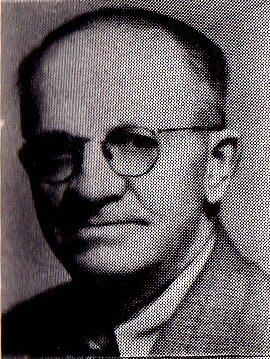 Some years later when Joseph Moser became President, I became one of his counselors, also brother Kern. After some years John asked to be released and I became President ofthe Branch on the 21st of March 1915, with Brother Kern and Alma Moser as my counselors. During this time we held the meeting in the old tithing office, later in the new one at Preston, until the 13th of August 1916, we held our last meeting. During the later part of the war some of the people of Preston made it very hot for the German speaking people yet most of them were Swiss, but that did not make any difference. So President Geddes came to me and asked me not to hold anymore meetings. After the war many of the German people had moved away so we never started to hold the meetings anymore, and I never was released to this day. That closes up this chapter of the German Saints of this part here, so I will go on to some of my other duties in the Church. Making in all twenty years that we held German Meetings with the people of Franklin Stake. Now going back to the year 1899, when I ws called as second counselor to Bishop Edward Perkins in the Mapleton Ward. When Orron J. Merrill moved to Preston I took his place and his son Preston my place in the Bishopric. I was chairman of the School Board for six years, and Brother Merrill was the Clerk, and when he moved away his son was appointed in his place. While on the school board I had a schoolhouse built in the upper end of the District, with Harrison R. Merrill as the first teacher. That way the children of the upper end would not have to go so far to school. The children in the lower part of the Ward met in the old meeting house. While I was in the Bishopric Brother 0. J. Merrill was the Ward Clerk and clerk of the school board. After his father moved to Preston, 0. P. Merrill, his son, was the Ward Clerk and clerk of the School Board. Speaking of schools the first school that was held in Mapleton was in the winter of 1886, when Bishop Perkins went to Lewiston to school. He let the people of the Ward have a school room so they all got together and employed Hirum Johnson as their teacher. All children from seven years up to thirty, married men and young ladies went to school there all in one room. Some came from Franklin and Nashsville. I was feeding cattle for Harrison Thomas that winter and lived with Olive Sweet, she had to board me as she was living in their house, and they paid $150 for my schooling and $.45 for a book. I had to chop all the wood for the family. I was fifteen years old. This school house which was built by the efforts of the people of the upper part of the District, was the first schoolhouse built in Mapleton Ward with H. R. Merrill as its first teacher. In 1899 in June I was ordained a High Priest by George Parkinson, President of the Oneida Stake, and we labored unitedly together in the Ward. Bishop Perkins was very kind to prepare me for this work, and in his home he read the Book of Mormon and the Doctrine and Covenants to me. So, that I may more fully understand the Gospel, and that I might be an example to the people of the Ward, and he taught me the Law of Tithing, and that we may be worthy to receive all the blessings that the Gospel had in store for His faithful children. So on the 21st of February 1900, we were recommended to the Logan temple to receive our second washing and anointing by President Morgan, a blessing that not so many have received, which is the greatest blessing anyone can receive in the House of the Lord, for which I have tried to be thankful all the days of my life. In the Spring of the same year, as there was a severe drought in Southern Utah, President Lorenzo Snow went to St. George, and met with the people there and told them if they would pay an honest tithing the Lord would bless them and send rain to save their crops. As the church was in a very bad financial condition at that time. So on returning to Salt Lake City President Snow called a special meeting of all the General Authorities of the Church to meet in the temple on the Law of Tithing, on June the 2nd at 9:00 A. M. And as Bishop Perkins had taken so much interest in me he asked me to go with him, only the Bishops were called. All the General Authorities spoke in the Meeting, after which they all shouted “Hosanna to the Lord”. We were in the Temple from 9:00 A.M. until5:00 P.M. The meeting was in the room known as the Celestial Room. At the close of the meeting President Snow said, “If you will go home and pay an honest tithing, the Church will be freed from debt, and the Lord will forgive you of your past neglect, and I promise you your homes will never burn.” From that time forth I always paid a full tithing as long as I lived on this earth. This blessed land of America, which God has blessed above all other lands. So these are some of the blessings that your mother and I received through Bishop Perkins being so kind to me. In appreciation for the blessing the Lord has given us, I desired to do my full duty in my calling with the people of this ward, and we had many opportunities to be called out day and night in time of sickness and death, among the people. We labored together eight years and had much joy in our labors. I have given you some of the ways I made a living for the family. To make a living during this time and to care for the family, I farmed, raised hogs and horses, milked cows, separating the milk and selling the cream, and making butter getting $.10 a pound at the store. The most I received while selling cream from six to seven cows was $35 a month. I also sold cream separators to the people of Franklin and Preston to make a little extra money. I cut grain with the binder for the people in Mapleton. I quarried stand stone for the Lewiston Meetinghouse, and some buildings in Preston. The Riter Brothers Drug Store and other buildings. For the hogs we received $4.00 per hundred. I had now lived on Worm Creek, Mapleton twenty-four years and I have related only some parts of my life. During this time in my life it was necessary for us to look toward the future, and seven children had been born to us in our first home. As the family got larger I built room onto the house. During this time my sister Mary was working for a family in Logan and as she was not feeling so well she came home and we needed someone to help mother as Bertha was a baby at that time. But in September Mary came down with pneumonia and died the 5th October 1900. She had been born in Providence, Utah the 11th of October 1881. At that time most of our children were sick with scarlet fever, but they got well with our care and the help of the Lord as it was hard to get a doctor. Before leaving Mapleton, speaking of building I feel to give some information pertaining to my father after his third wife died, Mrs. Weirman. He married Mrs. Shaub of Logan and bought the house of her son Gene. He lived in Logan a few years but he wanted to come back to Mapleton again and wanted me to build him a house in my orchard. I bought some sawed square log from Kall Wheeler, and build him the house. He paid for the materials and I did the work free, and I moved them up from wagon by team, but it was only a few years until he wanted to move again. He had already lived in Preston twice before. The first time where Ernest Porter lived, and before that out where Jim Smart’s place is. I then began to haul tone to Preston and John laid up the walls in 1907. In all the houses he lived in were one in Providence, two in Logan, one in Worm Creek, three in Mapleton and three in Preston and he died the 121h Aprill908. When I started to build my home after his death I moved his wife back to Logan with team and wagon. I will pass over some years as things went on as usual. We began to look to the schooling of the children, as there was not much opportunity in Mapleton. I bought five acres of land in Preston and during the winter of 1905 and 1906, I began to haul sandstone from the quarry for the building of our home. I also planted trees in the spring of 1906, as there was nothing on the land whatever, only a fence around it. So this was the plan for us to move to Preston, not to improve ourselves better financially, but to make it better for Mother and all of us. The Bishop was called to go on a mission, and I was in line for Bishop as things looked at that time. Mother was already alone so much with the family and I had so many meetings to go to at night. I was still in the German Organization, and I was so far away. I had from two and a half to three miles to ride on horseback to meeting to the home of Brother Merrill or the Bishop. In all the eight years I labored in the ward only one ward was held in our home. I leave the rest for you to answer whey we made this move which needed much consideration and prayer, and the guiding care of our Heavenly Father in making this move. So in the Spring of 1907, after renting the farm to Hart Wheeler of Mapleton, I built a frame house sixteen feet by twenty feet to have a place to live in. Also, we had a tent for some of the children to sleep in, so I would have the family with me while I was there building our home. I built the barn a place for the cows and chickens. I hauled logs for the bam and most of the lumber for the house from the sawmill on Cub River during the summer. In October of 1907, when the frame house and the bam were built we all moved to Preston. We were all glad especially the children, when they could see the train and hear it when it came to turn on the Y. So this was a great change for all. This was the first time I lived in town, since we left Providence. So in the Spring of 1908, as soon as the snow was gone I began to dig the foundation for the house and laying up the walls; doing the work myself. Our second home in which all the children were brought to men and womanhood. This was the most happy period of our life. In order to get the large stones on the wall we had to roll them up some logs, as they were too heavy to lift. I hired Adolph to help with the work for a while, but before I got the walls finished I took down with Typhoid Fever. Adolph and Mr. Peterson finished the walls. This was in the latter part of September, and I did not know any more of the building of the house till it was finished so the family could move in. Preston was a baby then and I remember that he cried so much it must have been hard for Mother. I can’t give much detail concerning my sickness, only that Mr. States was my doctor and a lady Mary Bodily was my nurse. Brother Arnold Shuldhess, the editor of the German paper “Beobachter”, was up from Salt Lake City and came and administered to me when I first took sick. When Miss Bodily had to go some other place they got Maude Stocks for my nurse. They gave me very little food; mostly brandy and whiskey, as food is most dangerous in Typhoid, at least that was the way they used to do for Typhoid Fever at that time. I never used liquor at other times in my life. Before I forget, my sister Regina, about the year 1886 also came home from Logan where she had been working and came down with Typhoid and there were no doctors here as there was no town of Preston here then. If there had been we would not have had any money to pay them; so her mother treated her the best she knew with tea from different herbs. Our prayers and faith were in God and she lived and got well, so we did the best we could under different ways and conditions. I will again go on with my own case. The latter part of October as I remember, I began to improve in health and they began to give me some food, as I was getting very hungry and I thought I would not get enough to eat anymore. Mother was very much afraid she might give me too much to eat, as that is the most dangerous time of the disease. The first time I went out doors again was the beginning of November. The trees were all yellow and I went up town to vote on November 6th 1908. I am sorry to say that this was not the end of our grief and sickness, so we had to start all over again and as I write these few lines it fills my eyes with tears when I think of that dear Mother that never gave up, that watched over you all night and day with faith in God for a better day. The Lord heard our prayers and she had the privilege to bring you up to manhood and womanhood, but that was not the end of our trials as stated before. When Clara and Anna came down with the fever we had to get Doctor Emery, as Doctor States lived in Franklin. As they had to come most every day and we had a nurse that did not belong to the Church. She stayed at Preston Rooming house and we had trouble with her as I will tell you later when I get to that. By this time we were living in the new house. I think it was sometime in December. But, under the care of the new doctor and the new nurse the girls did not show any improvement. It was not long till they came down with pneumonia and week after week they did not get any etter. The nurse had a lady friend that visited some time in the evening. One day I found some empty whiskey bottles in a pile of stone that was beside the house. I at once told the Doctor we did not want his nurse any longer. He said he had a Nuffer barn place in Weston for her. He said that we would be responsible if something went wrong with the girls. I told him I was willing to take the responsibility. The nurse left and shortly she came down with the fever at the rooming house. It was only a week or ten days till the girls were up on their feet again. It was now the latter part of February and what a relief it was especially for that dear Mother, when all could rest again. Now during my sickness some of the people of Mapleton had been told by Doctor States that there was not much hope for me to get over my sickness and mother heard of it. She prayed to the Lord saying that if he would spare my life she promised Him she would let me go on a mission, under almost any conditions whenever called. So during the summer of 1909, I worked at whatever I could find to earn something to take care of the family, and to keep out of debt, and fmd planted what we could on the lot for the next winter. Sometime if February of 1910, I received a letter from Box B, as it was called in those days, when anyone was called on a mission. 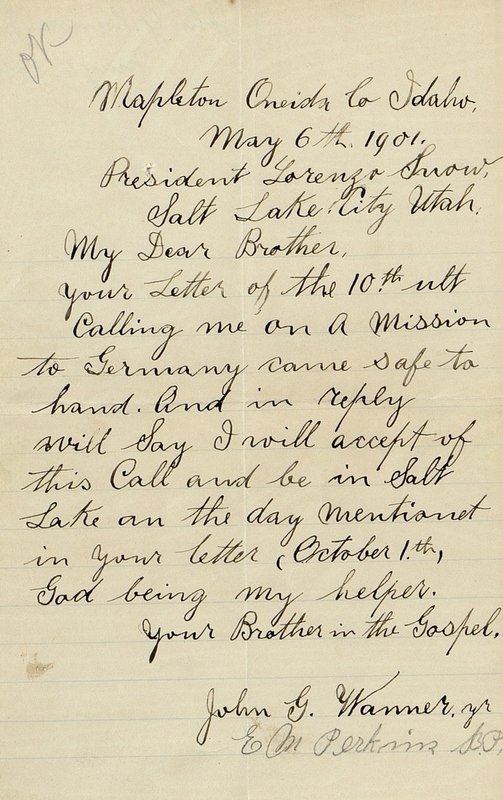 I did not know anything as to a call for a mission when I received the letter stating if I could accept this call, if I could be in Salt Lake City on April the 18th. I do not know if Bishop H. Geddes had told the authorities of the Church anything of my financial condition or not, as I remember he did not to me; which was very limited at this time nor did he tell me anything about being called on a mission. We did not hesitate for a moment, but told them that I would be there at the above date. As we had no porch on the south side of the house I went to work on it before leaving. I also built a shed for the white top buggy so it would be under shelter while I was away. On the 15th ofFeb 1910, Laura was born at home with Mrs. Nancy Beckstead in attendance, which made it still harder for me to leave you all alone. I also planted some garden before leaving. So in the morning of April the 18th, I was on my way, Clara going with me to Salt Lake as mother did not want me to leave alone. That way she could hear from me just a little longer, Clara was then nearing 15 years of age and Laura was going on two months. As I remember I was set apart for my mission by Jonathan C. Campbell to the Eastern States Mission to labor under Ben E. Rich. After a few days in Salt Lake I left with other Elders for New York City, stopping at Des Moines, Omaha, Chicago, Buffalo and on to New York. After a few days there I was appointed by Ben E. Rich to labor in West Pennsylvania, with Elder Hyrum Nelson from Cleveland, Idaho. I was then sent by way of Philadelphia to Pittsburgh with Heber D. Clark as our president. We were then sent out in the country two hundred miles tracting on the way, where there was a Branch of the Church in Buck Valley. It would be too much to give my missionary account, it is written in my missionary journals, those red books in this home. As we met in Conference in Pittsburgh, with Ben E. Rich and all the Elders in February of 1912 I was released to return home. It was most difficult for mother to carry on any longer with the large family as she had to borrow most of the money while I was away, as it was a dry season, and Mr. Wheeler, the one that bought the farm did not make any payments and the Bank charged 12% interest. When I arrived home Laura, it was on her birthday, was two years old. One great blessing while on this mission was that I did not have one day of sickness and Mother and the children all had good health, for which we thanked the Lord with all our hearts. It was February the 15th 1912 when I arrived at home in time to make arrangements for a new life in caring for the family again, and to pay off the money we had borrowed. But, before I could do that I had to borrow some more to buy a team with which to go to work. I borrowed $700 off of Grandpa Wanner; the team cost $300. On the 15th July 1912, I purchases thirty two acres from Mr. Charles Nelson west of town on time payment, at one hundred dollars per acre. I then planted it in hay and grain, and the same year a hail storm came and destroyed the crop of wheat. I then went hauling sand and gravel for a living, and helped Uncle John with the haying. On returning home I was asked by President Joseph Geddes to visit the wards of the Stake with the High Council for two years. It was before the Stake was divided. I also was asked to take my place again in the German Organization Meetings, one or two times a month. During this time I was serving as a Ward Teacher, a Sunday School Teacher, and quite a number of years as the class leader of the High Priests group in the ward, at Priesthood meeting, so I had plenty to keep me busy. I was also the ward Chairman ofthe Anti-Tobacco and Liquor campaign. During the First World War, I was called as a Counselor to Peter Hanson, who was Stake Superintendent of the Religion Class until the Stake was divided. In all six years, once or twice a month on Sunday or week days we would go out in the Ward to find someone to teach Religion Class in the schools, or to visit the schools that had teachers as we found it necessary. I was called as Chairman of the Genealogical Organization of the Ward. When the Ward was divided, and your mother and I worked in the Genealogical Organization. We were released when Orion Jensen was Bishop. During the years of 1923,24,25, and 26, I was called to baptize the children of the Franklin Stake. Charles F. Hawkes had done that work before. Also, at times I was called on to baptize children of the 2nd Ward at the Stake House. While in the old Church House I was a teacher in the Sunday School in the different departments at different times. On October 30, 1916 I bought the farm in Dayton of June Jensen, Sam Morgan and H. A. Peterson of Logan, at the price of $5,500 so we would have work for the boys, so they would not have to go away from home to find work. For a number of years we had to dry farm, before we could get water. We finally got thirty shares at $130 an acres. As the land was all under bond it cost me $800 to buy the rest of the land out and we had to pay $7 per acres to get a ditch thru the Eccles Farm. I traded the land in Preston to Sam Morgon at $125 an acre that helped some. I had to clear off some thirty-five acres of sage with axes all by hand. That was all we had to do that kind of work for number of years. I had the cabin on the west hill of Peterson’s and had to carry the water from a spring below the hill in Petersons’ for cooking and vitrolling the wheat. I had to get a right-of-way from Brother McCarry at a spring to water the horses. We also had a stable on the hill for the horses. Usually we would fill our grub box on Monday morning and stay till Saturday and Mother and the girls would take care of things at home during the week. When we got water on the farm we moved up on the flat to the west of the farm. We went down the creek for water to use. We then built another room and Fred moved over with his family for the summer to help with the work as we rented the Miles farm and a year or so later Miles bought a house that we moved on his farm, for Fred and his family to live in. Later on we built another room onto it. Preston helped us with the work after school closed and Joseph moved in up stairs when he got married, working with Roy at the car bam at the U. I. C. Railroad. In 1929 we built a house on the farm for Joseph to move in, as we had more work all the time. The cost of the house was $1250. Then came the crash of 1929, when wheat dropped to 30 cents a bushel and hogs to $4 per hundred and beets $4 a ton. To pay our debts and pay for the house all of us got together with a lot of hard work and the help of the Lord we pulled through. We also sold some hay for $5 per ton. In the Spring while the boys were thinning the beets, I was doing the summer fallowing, with the gang plow, with six horses; for a number of years. We started out with only three horses on the farm for a number of years. We could not raise hay without water. We had to haul the hay for the horses from town. Also, for the headers Mother would come over and cook for them. At the first harvest we did not have very much, and I was away trying to earn some money to pay for the heading. Louise and Preston drove over and brought them their dinner. I also went up to Glendale one summer and helped Fred Wanner and Hyrum Jensen get up their hay. They gave me a ton of hay for three days work with wagon and team and I would haul it over to the farm. That was during the early part of our farming that I am writing on this page some of our hardships. In order to make some money to pay for the farm and to live, as we only raised grain, as we had no water on the farm, I would work on the header and do stacking. Also, I would go out with Fred Nuffer and Fred Steuri doing cement work for school houses, and other buildings. I worked for Joseph Moser as a carpenter on the Gymnasium, also did cement work, while Fred was hauling gravel. I hauled the first load of gravel for that building, also hauled gravel for the Jefferson School Building. I worked for Struve on the 4’h Ward Meeting house doing cement work on many houses in town. I had my team hauling gravel when they built the first sidewalks in Preston, until they were finished, then to the City Water Reservoir. When the Utah-Idaho Central Railroad was built I worked on the cut south of town ten hours a day for $2. Again I helped Joseph Moser when he built the beet dump, the high line by Tom Clayton’s place. I then got a job on the dump with the Sugar Co., loading beets on the cars. The next two years I was tare man for the company, and got lots of scoldings from the farmers, but the company treated me well. They used to pile any beets on the ground in large piles in different places, and haul them on the cars later. So, the boys Fred, Joseph and I would haul beets the rest of the fall. We would leave right after daylight and work until dark, so when Sunday came we were glad to get a short rest and go to Church, or I would be called to visit some Ward in the Stake in the interest of religion class to get in into the school, and on Monday back to work. Going back to the farm work, in the fall of 1931 and 1932 I bought a herd of sheep to fatten, then took them to Denver to market to help get out of debt. While Fred was living on the Miles place and Joseph on the farm there was some difficulty, I do not know what it was, and Joseph moved back to town. Fred moved into the house on the farm and young Fred Wanner moved in where Fred had lived, as he had him working for him in 1936. I bought a tractor to do the farming, and did the summer fallowing with it that Spring. As Charles Nelson was janitor of the Ward House he asked me if l did not want to take the janitor job. So I had another job, which the girls helped me with at $11 a month, but it all helped. That was during the First World War. Thinking it was time to retire from farming at the age of sixty-six I sold the farm in 193 7 to my son Fred. In Jun 1937 I bought the Dodge car and the Gamble home. The next year the McCarry farm. The summer of 1937 we went on a trip, Mother and I, Louise, the twins, and Joe and Gretta to Los Angeles, visiting Jim Cummings and Fred Nuffer. From there to San Francisco, then on Highway 1001 , the Redwood Road to Portland, Oregon up the Columbia River to Boise, Idaho and back. I had to come home after over two weeks absence. Mother and I had been to Los Angeles by train to visit Jim and Anna, when they lived at Beverly Glen, and again when she died the 25 January 1928. As given before the third time to California and again to San Francisco to the fair. Mother and I, Louise, Joe and Gretta, when Gretta took sick. After Mothers death, myself and Louise, Ida and Gilbert, went to Los Angeles the fourth time. Later when Jimmy Cummings was married I went on the bus to his wedding. Some years after Mother’s death, I and Louise and the twins went on a trip by car to Zions National Park, Cedar Breaks, and Bryce’s Canyon and to Yellowstone. The first time we went to Yellowstone National Park with Mother, Louise, Roy and Clara. The last time we went Louise, the twins, Donald and Joe and Getta and I went. We also went a few time to Nephi to the Roundup. These years while Ward Chairman of the Genealogical Committee, we assisted the Stake in getting up large excursions to the temple on the U. I. C. Railroad, every month. All during our married life we would go to the temple every years as often as we were able to go. We carried on research work through the Genealogical Office in Salt Lake City, and we received sheets of names on the Nuffer and Wanner line, and my mothers Griener line, all at our own expense. I have the sheets in my trunk with the work all completed as you will find them there. For twenty years after buying the Chevrolet car and the Dodge, we went to the Temple, whenever we could once or twice a month with a full car of people from the 2nd and 1st ward, until I took sick in December 1948. Since then I have been to the Temple three times. I am writing this May 11, 1950.While going to the Temple one February morning early it was snowing and the road was slick. I had with me in the car Mother, Louise, Brother and Sister Rindlisbacher and Mrs. Clarence Corbridge. As I was getting near the Utah line I felt there was trouble ahead. I was going about twenty-five miles an house, when George Wanner passed me. When half a mile over the Utah line the car struck a bump in the road and turned over in the barrow pit then over on its side. At that time a car came and took all but Mother and I and Louise to the Temple. Then came Orion Jensen and took Mother and Louise to the Preston Clinic to be examined by the doctor. I stayed with the car until Petterborg came. The damage on the car was over a hundred dollars. Some months later Mother began to have pains in her back and kept getting worse as time went on. During July she got so bad I took her to the Preston Hospital for an xray. She was there for a week, and Doctor Cutler said we had better take her to the L. D. S. Hospital in Salt Lake as they could not do anymore for her there. We went to Salt Lake July 24th we were told that she had tumor of the spine. She was there for a week, when we were told that they could not do more for her so we bought her home. She died the 10th August 1940. If your Mother was alive as I am writing, we would be celebrating our 55th Wedding Anniversary, but as it has fallen my lot I’m all alone in this home where you all have been brought up under her loving influence and with my deepest love for you all. I shall ever thank God, my Heavenly Father for the gospel and its blessings.